This page highlights the best of media coverage of our campaigns to expose government waste and hold Wellington accountable. If you are a journalist seeking comment, please call us on our media line (24 hr) 04 282 0302. To join our national media distribution list please click here. Too much of tax policy is debated with pistols drawn at 10 paces. Each side accuses the other of ignorance or being steeped in moral turpitude, and preferably often both. Far too much time is spent feuding over the incentive effects of taxes. If you inspect closely the history of the warring sides, they all agree that incentives matter. If you tax something, you see less of it; if you cut taxes, you will see more of it. The difficulty is the advocates for various causes are disappointingly selective about when they admit this is so. French economist Thomas Piketty could not be more honest about the impact of a higher top tax rate. He welcomes the strong incentive effects of high marginal tax rates. Why? Piketty wants to use high taxes to put an end to top incomes. He wants few to earn a large income and if they do, they should face ruinously high 70-80% marginal tax rates. This honesty of Piketty is the basis of a ceasefire. Let us all admit that taxes have incentive effects and argue whether that is good or bad or that other considerations are more important than efficiency. Too often in debates over income tax cuts, the opponents will not give an inch on the labour supply and investment effects of lower taxes. But when the same groups argue about poverty traps when welfare benefits are wound back or when tax rates and Working for Families abatement rates interact, they admit that work must pay. Ordinary families will work less and second earners may stop working. Those deeply troubled about poverty traps from high effective marginal tax rates deny point blank that putting the top tax rate back up to 39% or more will harm labour supply, investment, entrepreneurship and the incentive to go on to higher education. On taxes on sugar and tobacco, consumers are said to be fairly responsive to higher taxes. Unkind words are said about the motives of those that disagree with these taxes. The opposition is about how taxes on sugary drinks is a waste of time unless they are prohibitively high because there is plenty of substitute sources of sugar and fattening foods. A higher tobacco tax is much more likely to cut smoking because there is no reasonable substitute. If the government really wanted people to quit smoking, rather than raise more revenue, they would legalise the sale of the safer alternative – e-cigarettes containing nicotine. Opponents of company tax cuts are unwilling to admit that in highly integrated global capital markets a lower company tax wins more investment. They say that more tax is paid in the home country of the foreign investor if we cut our company tax. In the next breath, they will rage against Facebook and Google for avoiding New Zealand company taxes. This is despite their previous argument implying this tax avoidance must be futile because Facebook and Google will pay more taxes offshore if they pay less company tax in New Zealand. European Union politicians will say in domestic elections that company taxes do not deter investment but still relentlessly bully the Irish for its 12.5% company tax rate because it was winning more investment at their expense. What is the point of the EU and G20 push for tax harmonisation unless it is to stop competition for investment through lower company taxes? It is perfectly reasonable to agree on the effect of a particular tax policy but have an honest disagreement about its desirability. A higher top tax rate will not raise as much revenue as some hope but that may not matter if you want less income inequality. Sugar taxes may not reduce obesity by much but it could be a useful first signal about healthy eating. Others disagree because sugar taxes are ineffective and because people should be able to live their lives for better or for worse by their own lights as long as they do not harm others. People meddling in the lives of others because they know better has always ended in tears. At least we should keep the conversation civil. Incentives matter. Taxes bite. The disagreement is over who you want the taxes to bite. By how much usually depends on how you value the competing goals of efficiency, equality and liberty. Centre-right political parties have a moral duty to lower taxes and allow people to take home more of their own money. The National Party’s values – limited government; individual freedom and choice; competitive enterprise and reward for achievement – underpin this commitment to lower taxes. It’s a basic principle that right of centre parties look to uphold the world over. Even UK Prime Minister David Cameron, who would hardly be regarded on the right as a dry, is on record as saying that the simplest way to help raise living standards is to allow people to take home more of their own money. Despite the eternal honeymoon in the polls, the John Key-led government has been cautious at best when it comes to making the case for this most basic philosophical tenet of centre-right thought. Its actions don’t match its campaign slogans. When Mr Key announced the government would look to deliver a $3 billion tax cut package after the 2017 election, people could have been forgiven for thinking that it felt a lot like Groundhog Day. Just two years ago National raised the hopes of households by indicating tax cuts were on the horizon. But, like chasing the horizon, the promised Brighter Future of tax cuts and increased discretionary spending seems to be perpetually just out of reach. Contrary to the “no new taxes” billboard, since the last election National has introduced four: the “Netflix” tax on online goods and services; bright-line capital gains tax for houses sold within two years; the “travelers’ tax” at the border; and the new telecommunications levy. In addition, bracket creep has meant Kiwis are taxed at higher rates as their wages have adjusted with inflation. ACT’s David Seymour says that since 2011 the Inland Revenue has taken an additional $2.1 billion through bracket creep than it would have if income taxes were indexed to inflation. The $3 billion tagged by the government for tax cuts after 2017 are too little, too late. Rather than a being a philosophical project to shift people and business toward self-reliance, the proposed tax cuts are just electioneering. If the government were serious about cutting taxes, it would stop expanding corporate welfare dependency. While Finance Minister Bill English is rightly focusing government resources on the 10,000 most vulnerable people so that they are able to stand on their own two feet, his colleague Steven Joyce is dishing out more corporate welfare every year. Will the government’s legacy be one of alleviating welfare dependency, or expanding it from McGehan Close into Queen St? The most recent report published by the Taxpayers’ Union on corporate welfare, Any New Kids at the Trough? found that the government was spending $1.34 billion on corporate welfare in the last budget. That’s $752 for every New Zealand household. And it’s not as though the corporate welfare projects are even paying off. Take for instance the French-owned Gameloft that went under owing the government $2.9 million; the grants to Team New Zealand and its opposition, Oracle; or the handouts to the German-owned business software giant SAP. But it’s not just corporate welfare. The government has failed to tackle the problems Mr Key talked about when he was the leader of the opposition. There are still more back office bureaucrats and paper shufflers than at any time under the Helen Clark-led government. There is plenty of room to cut taxes. National simply needs to cut spending, stop trying to pick winners with our money and cut out the nonsense about Wellington spending our money better than the people who earned it. Over the weekend we revealed more Upper City Council corporate welfare 'economic development' grants amounting to $375,000 of ratepayers’ money. Joining Burger Fuel, grant recipients include Subway, Vogue (a clothing store), Bed Bath and Beyond, and even a hairdresser! "It is economic trickery benefiting only the favoured businesses. "Take the example of Prodigy Hair. There are at least 29 hairdressing firms in Upper Hutt, but the council picks this one out for a handout." Previously, the council defended its corporate welfare scheme on the basis that it was creating jobs, Williams said. "Of course the politicians and officials ignore that every cent is drained from the very community they are claiming to help. It is intellectually dishonest. "Upper Hutt ratepayers are smart enough to see that this isn't economic development, it's robbing the poor to pay the rich." To respond, Mayor Wayne Guppy spoke to Newstalk ZB's Larry Williams tonight just prior to the political Huddle with our Executive Director Jordan Williams and Vernon Tava. Fairfax has picked up our comments on SkyCity's recent comments to prompt taxpayer funding of the controversial convention centre. Auckland ratepayers should not have to pay for a blow-out in the cost of the Sky City National Convention Centre, councillors say. Economic Development Minister Steven Joyce raised the prospect of the Auckland Council chipping in to help fund the project, after new estimates revealed the cost could blow out by as much as $128 million. The increase in cost could leave taxpayers on the hook for any shortfall, but Joyce said the council could provide some assistance. The Taxpayers' Union has derided the deal as "corporate welfare" and called on the Government not to bail Sky City out. "The whole idea of the SkyCity deal was that Auckland and New Zealand would get an international class convention centre, paid for by SkyCity, in return for various concessions to the casino," Taxpayers' Union executive director Jordan Williams said. "It was never suggested or intended that the taxpayer or ratepayer would have to shoulder any of the burden. If SkyCity underestimated the cost of the centre when they signed the deal, that's their problem." Time for recall elections for local government? A lobby group says revelations Auckland Council spent $30,000 on "secret rooms" for Len Brown show New Zealand needs recall elections to dismiss politicians before their terms expire. The Council spent the money building a private bathroom and dressing room hidden behind a bookcase in the Auckland mayor's new office, the Herald on Sunday reported. The Taxpayers' Union today said the Government should give local communities the ability to petition for recall elections. "Councillors have already censured Len Brown for misusing funds but clearly the line in the sand is being ignored," said Jordan Williams, Taxpayers' Union executive director. "A recall option would enable ratepayers to petition for a vote to fire a shameless [politician] who lacks any respect for those who pay the bills." Read more. Voter recall options are gaining popularity overseas and it's time New Zealand had the conversation. Though often associated with the United States, where they have a long history and are used at both the state and local leve, recall mechanisms also exist in British Columbia, several Swiss cantons, the Philippines and Venezuela. Recently the UK Government introduced the Recall of MPs Bill to the House of Commons on 11 September 2014, after pledging to the public to go so upon election in 2010. Many UK MPs, led by backbencher Zac Goldsmith, think the Government’s proposed threshold of recall only after a committee of MPs has found the representative to have been engaged in “serious wrongdoing” is too high. Based on the swamp of emails we've been getting, many Auckland's think the threshold to censure a Mayor seems to be pretty high too! We think that it's time the Government gave ratepayers a voice between elections. A recall option would enable ratepayers to petition for a vote to fire a shameless politicians who lacks any respect for those who pay the bills. New Zealanders need a mechanism to replace elected representatives if they fail to perform or bring their office into serious disrepute. It’s time to have the recall conversation. Steven Joyce has provided a response to Jim Rose's Monopoly Money report - but appears to focus just on R&D tax credits, rather than address the bulk of corporate welfare identified in the report. Economic Development Minister Steven Joyce is disputing the Taxpayers’ Union analysis of corporate welfare under National, saying he disagrees with its characterisation of a subsidy and its estimate of would-be corporate tax rate reductions. 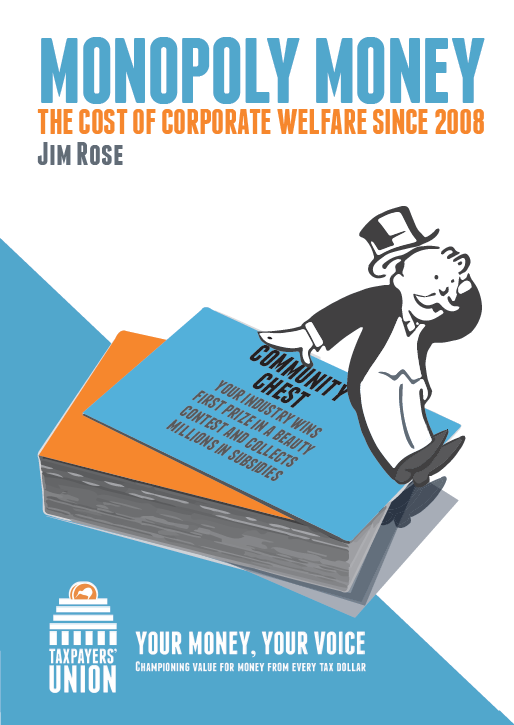 In the Monopoly Money report, Jim Rose – a former principal adviser at the Treasury and former senior analyst at the Ministry of Business, Innovation and Employment – concludes that such business subsidies are costing New Zealand households an average of $600-800 a year. On Friday we launched our hardest hitting report to date,Monopoly Money. The report includes forewords by Labour's Napier MP, Stuart Nash, and the Chief Executive of the Auckland Regional Chamber of Commerce & Industry, Michael Barnett, ONZM. This morning the NBR published Mr Nash's foreword as an opinion piece on its website (click link to view). Our Monopoly Money report can be viewed online here.